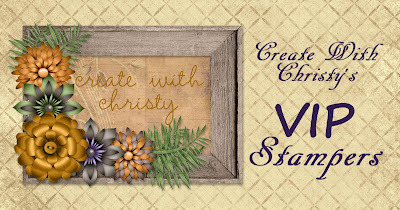 Create With Christy: Today is the Last Day to Get These Wonderful Bundles! Today is the Last Day to Get These Wonderful Bundles! Today is the Last Day You Can Purchase One of These Wonderful Bundles! The products in this suite are so beautiful! I've made a few cards with them already, and see a lot in my future. 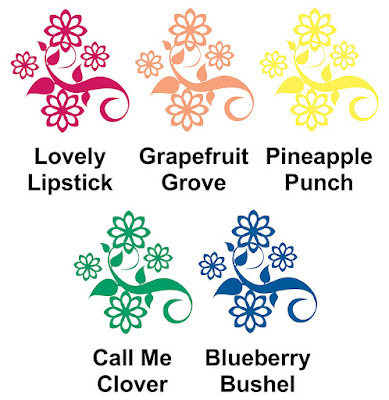 I think this is probably my favorite suite of products in the new catalog, and I think you'll like it, too. 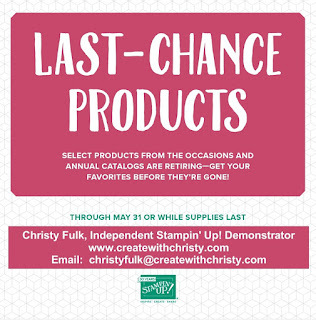 All of the products will be available to purchase separately in the new annual catalog, but these wonderful bundles will not. The three Share What You Love bundles include at least one free item, so they're all a great value! Orders Must Be Placed by 11:50 p.m. (MT) Tonight! 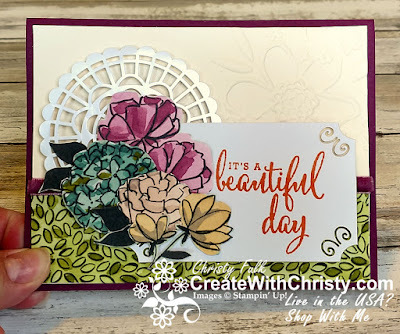 Here's a card I made USING ONLY products from the Just Getting Started Bundle. The only thing I used that's not in the bundle is SNAIL Adhesive. 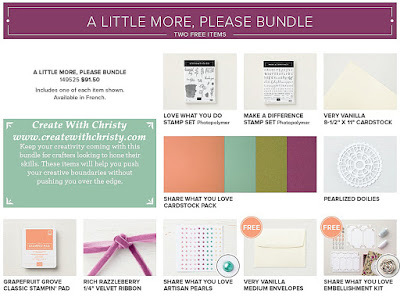 If you purchase this bundle from me, I'll email the complete instructions on how to make this cute little card. 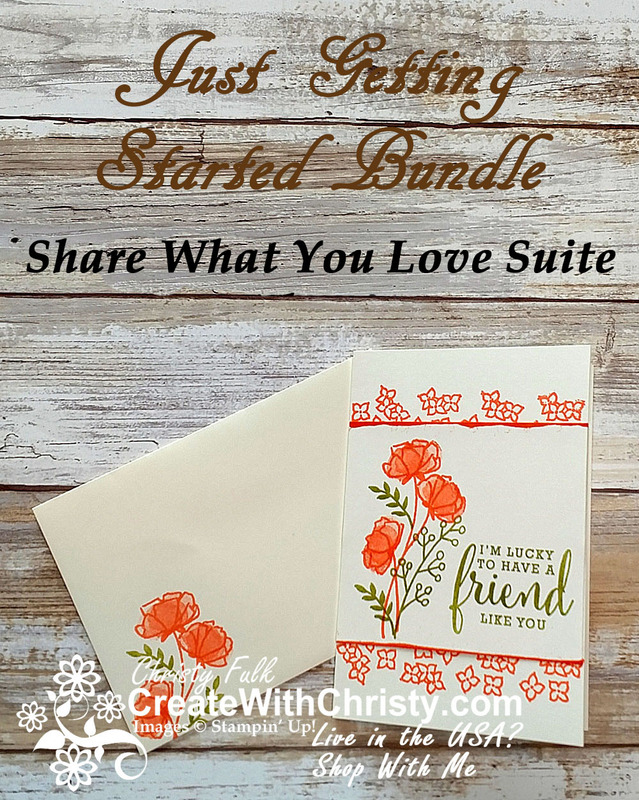 If you use this month's Host Code AJR9P7NG, I'll also send you my May Online Order Thank You Card (with instructions)* that also features the Share What You Love Suite products. 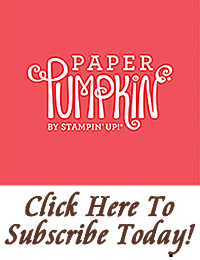 Add only $8 (before shipping & tax) more to your order (and use the same Host Code AJR9P7NG), and you'll ALSO GET the Brand New Pearlized Doilies FREE! 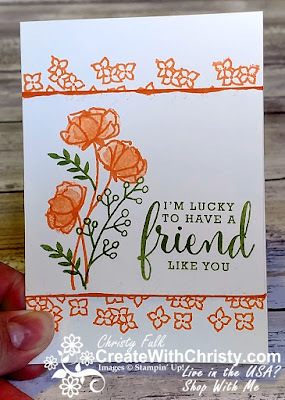 You can see these doilies on the following two cards below. 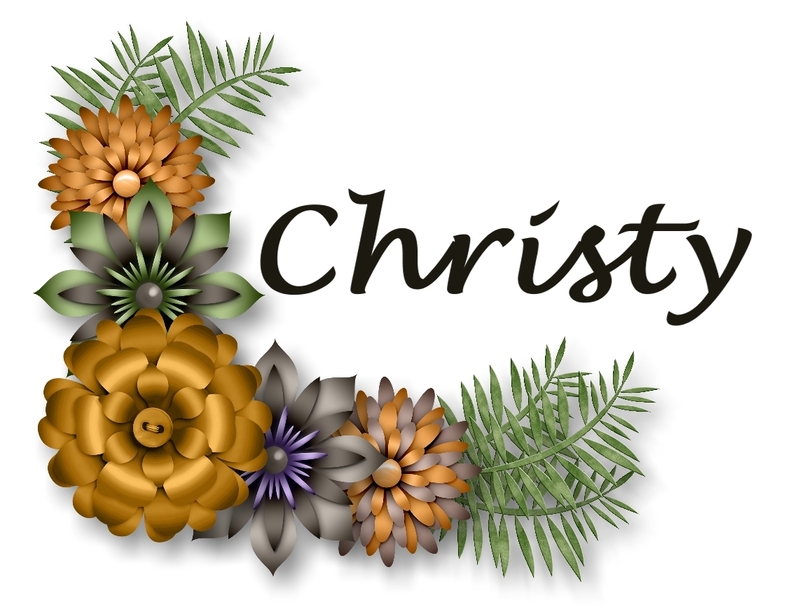 Here's a card I made USING ONLY products from the A Little More, Please Bundle. 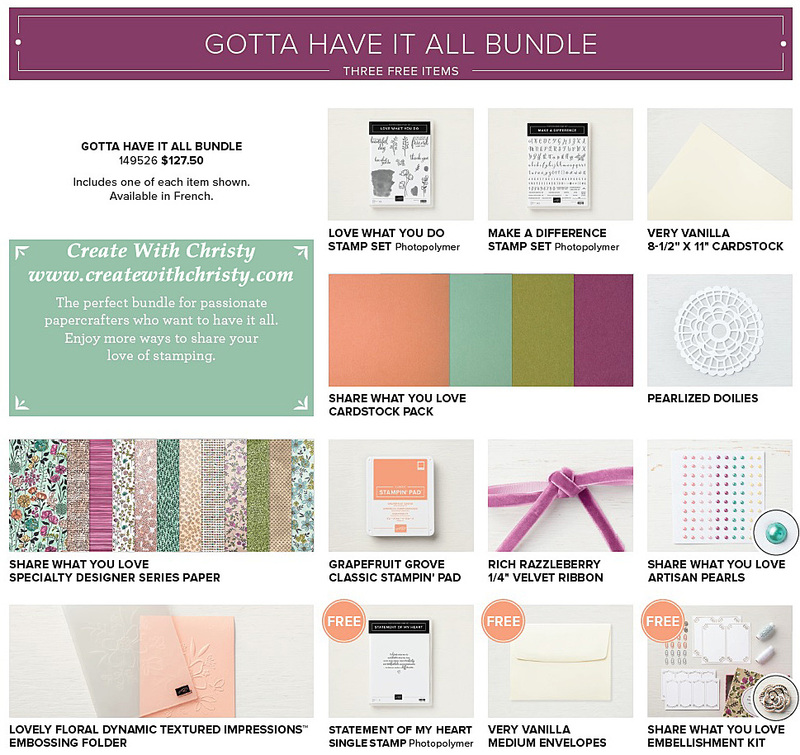 The only thing I used that's not in the bundle is SNAIL Adhesive and Stampin' Dimensionals. 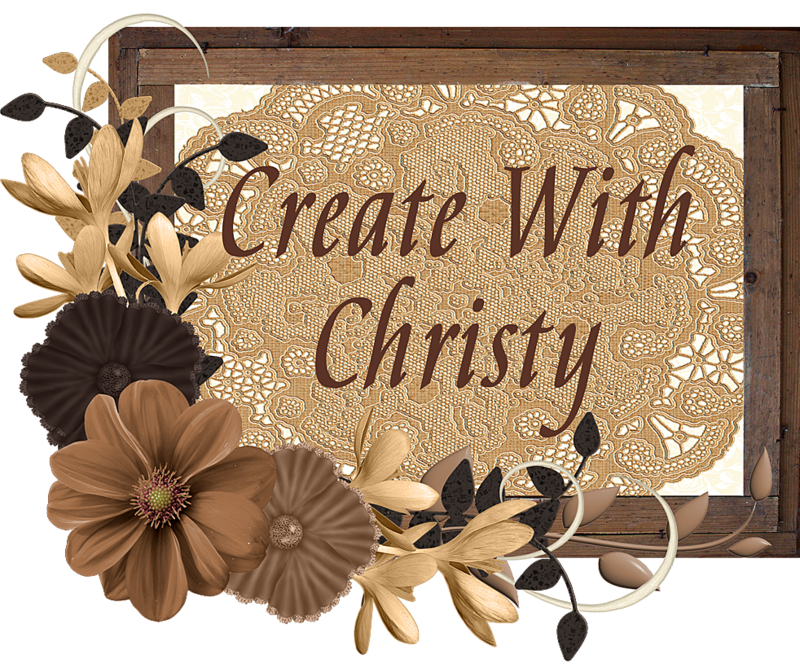 If you purchase this bundle from me, I'll email the complete instructions on how to make this card AND the "Just Getting Started" card above. 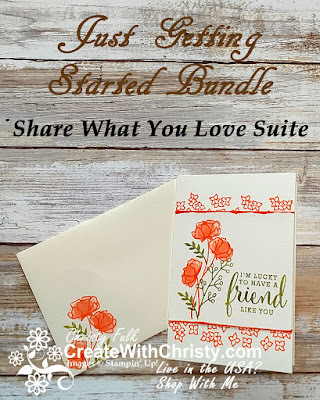 If you use this month's Host Code AJR9P7NG, I'll also send you my May Online Order Thank You Card (with instructions)* that also features the Share What You Love Suite products AND you'll ALSO GET the Brand New Pearlized Doilies FREE! 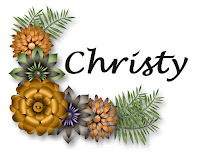 The doily on the card is Pearlized Doily. 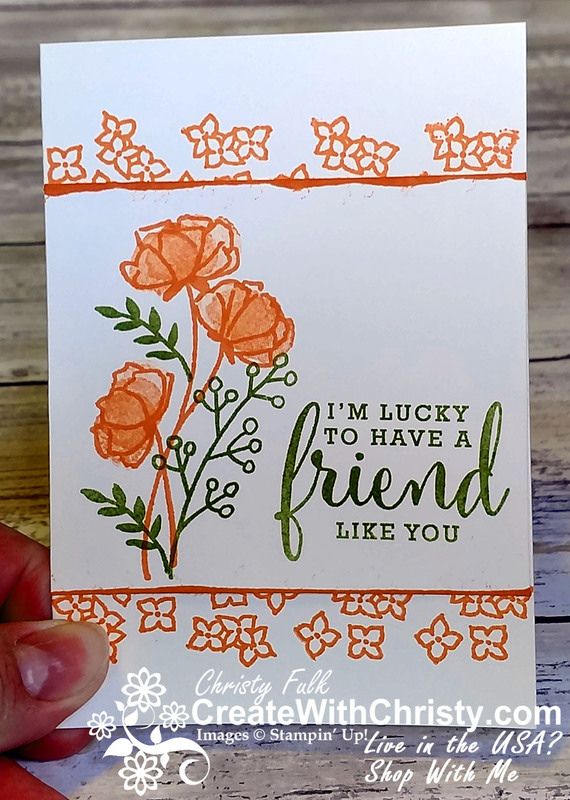 Here's a card I made USING ONLY products from the Gotta Have It All Bundle. 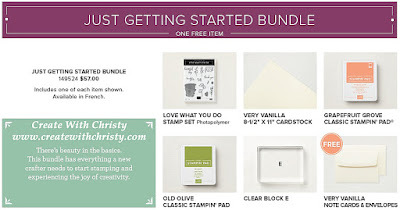 The only thing I used that's not in the bundle is SNAIL Adhesive and Stampin' Dimensionals. If you purchase this bundle from me, I'll email the complete instructions on how to make this card AND the two cards for the other two bundles, too! 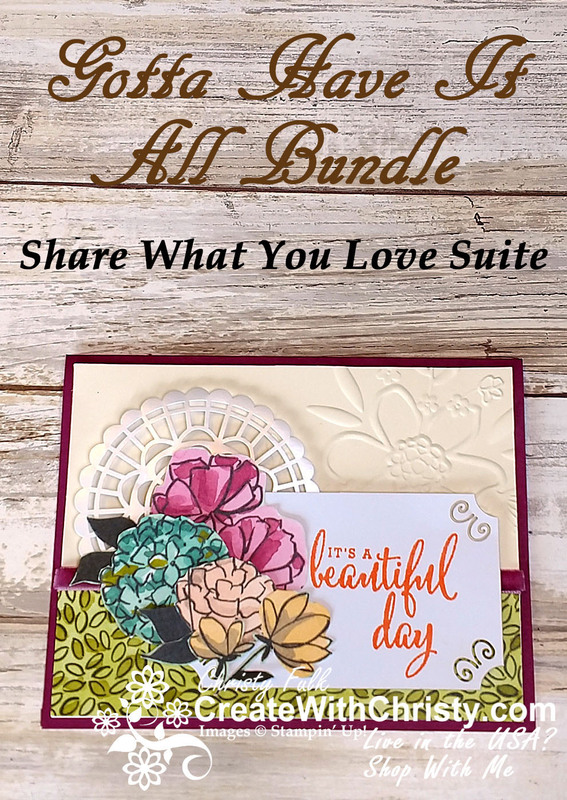 If you use this month's Host Code AJR9P7NG, I'll also send you my May Online Order Thank You Card (with instructions)* that also features the Share What You Love Suite products AND you'll ALSO GET the Brand New Pearlized Doilies FREE! 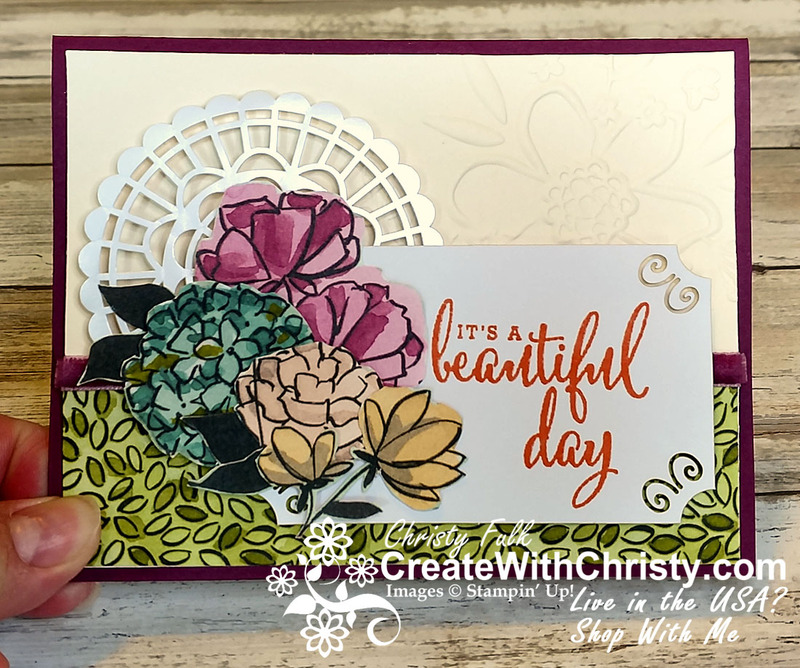 The doily on the card is a Pearlized Doily. 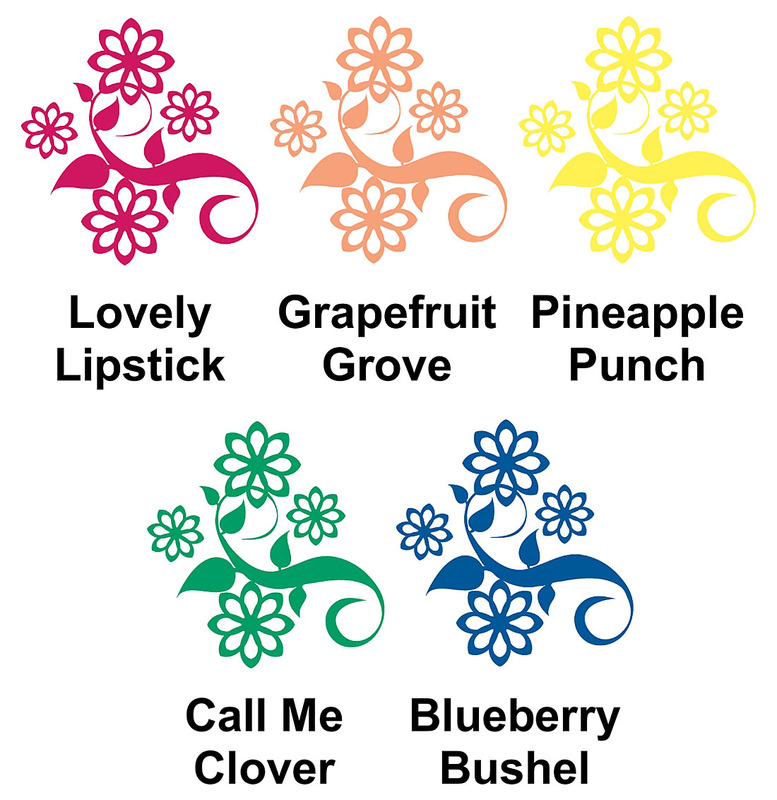 Would you like to get the BRAND NEW 2018-2020 In Color Classic Stampin' Pads EARLY? The bundle is even 10% off! This bundle will be available in the new annual catalogThen, you don't want to miss out on this bundle, either! 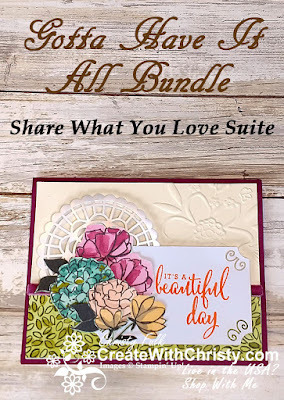 If you use this month's Host Code AJR9P7NG, I'll also send you my May Online Order Thank You Card (with instructions)* that also features the Share What You Love Suite products. 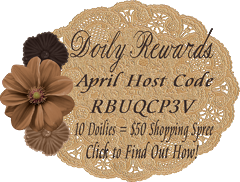 Add $31.25 (before shipping & tax) more to your order (and use the same Host Code AJR9P7NG), and you'll ALSO GET the Brand New Pearlized Doilies FREE! You can see these doilies on the two cards above. Click on the Picture Above To Order Your Bundles Today!